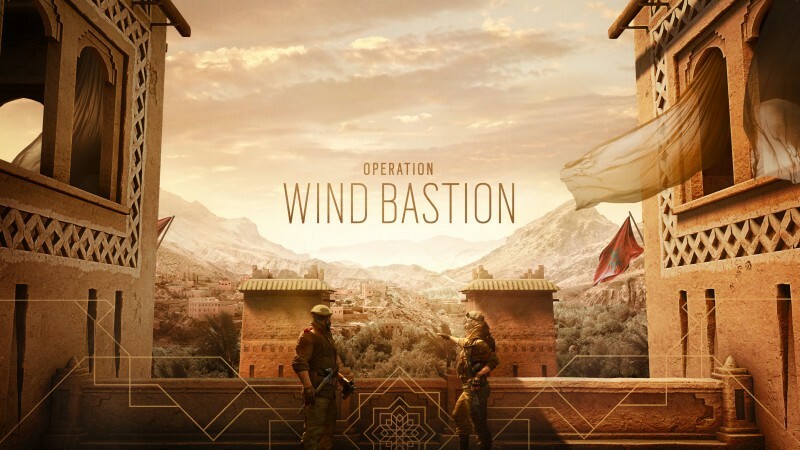 Ubisoft has announced the first details of Rainbow Six Siege's fourth season, Operation Wind Bastion, including two new operators and a new map as players journey to Morocco, and a full reveal later this month. In a blog post today, the team confirmed that the new map is a fortress in the Atlas mountains. "You’ll have the rare opportunity to test your skills inside a stunning mudbrick kasbah," the post reads. "Enjoy unprecedented roof access, but do try to stay focused despite the breathtaking oasis just next door." In addition, there's two new operators for players to play around with. The first, a defender, is a male character stationed within the Moroccan Special Forces. Described as "immovable as the mountains," the new operator emphasizes the ability to hold your spot for as long as you possibly can. The second operator is a female attacker who specializes in the ability to use her environment to traverse while on the offensive. "Perceptive and resourceful," the developers write, "she’s an expert on environmental operations with a knack for pushing the enemy back." A full reveal for the new map and the two operators will take place on the Rainbow Six Siege Twitch channel on November 17, taking place during the Pro League Finals for the game.